How many Zaporozhian Siches were there? The Ukrainian Cossack era is one of the most exciting and heroic pages in the history of Ukraine, as well as a unique phenomenon in world history. Historians have always taken a special interest in the Cossacks, who were glorified by the ordinary people of Ukraine in songs and dumas, lyrico-epic works of folk origin about events in the Cossack period of the 16 th and 17 th centuries. Unfortunately, owing to the lack of complete sources, a number of problems relating to the study of the Cossacks have not been clarified. It is generally known that the Zaporozhian Sich was the capital of Cossack liberties. Cossacks were drawn there by their hearts and minds, and the flower of Cossackdom was concentrated in the Sich. The word sich originates from the verb sikty, to cut down with a sword. Originally it meant a system of timber and reed fortifications. The word kish is another term often used to denote such Cossack military settlements. This word is probably of ancient Indo-European origin. Related words in Sanskrit mean “troops,” “the chief’s camp,” and so on. When the first Cossacks began creating their military formations, electing their chieftains, and building their fortified bases, they began using this word to denote the capital of the Zaporozhian Sich. The Sich was nearly always located in places ideally fortified by nature itself — on river islands that were hard to detect among the multitude of others in forest thickets located by the water’s edge and patches of bulrushes along river banks. The Sich was surrounded by a moat and a 10-meter-high earthen rampart topped with a palisade. Standing above the fortifications were tall towers with embrasures. The river approach was also strongly fortified. Inside the fortress was a square with a church and a pillory. The square was lined with long buildings known as kurins in which the Sich men lived, as well as officers’ quarters, the chancellery, and further on, warehouses, arsenals, craftsmen’s workshops, and merchants’ stands. The word kurin meant a building where Cossacks lived and had their kitchen, and a military and, later, territorial unit. There were up to 38 kurins where Cossack fellow countrymen usually lived. Thus, the sich means a clearing in a forest and indicates that the first Zaporozhian Cossack settlements were on wooded islands and in patches of bulrushes along river banks. Since the days of the Cossack historian Dmytro Yavornytsky, it is traditionally believed that there were eight Siches throughout the history of Zaporizhia. Available sources do not offer an unequivocal answer to the question of where the Zaporozhian Sich was located in the late 15th and early 16th century. However, for the later period there is much more information found in various sources. This information had led scholars to assume that the Khortytsia Zaporozhian Sich, one of the earliest known Siches, was founded in 1553-1557 (other sources point to 1556-1557) with the active participation of Zaporozhian Hetman Dmytro Vyshnevetsky, nicknamed Baida. He was an extraordinary personality with an eventful life. The Khortytsia Sich played an important role in the preparation of campaigns against the Tatars and Turks, but toward the end of the summer of 1557 it was captured and destroyed by thousands of troops of the Crimean khan Devlet Girei. After the destruction of Khortytsia, the Zaporozhian Sich was located on Tomakivka Island (1560-1593), on the Bazavluk River (1593-1638), Mykytyn Rih (1638-1652), on the Chortomlyk River (1652-1709), Kamianka River (1709-1711), at Oleshky (1711-1734), and the Pidpilna River (1734-1775). When the Zaporozhian Sich was destroyed by Russian troops in 1775, some Cossacks transferred it to the mouth of the Danube, where it existed from 1775 until 1828 as the Transdanubian Sich. Thus, there were eight Siches on the territory of today’s Ukraine and one beyond the Danube, in Dobruja (southeastern Romania). Meanwhile, the study of available historical sources provides ample grounds for concluding that the number of Cossack Siches was actually much larger. The first thing that must be taken into account is that Dmytro Vyshnevetsky-Baida built his town not on Khortytsia Island but on the neighboring island of Mala Khortytsia, also known as Verkhniokhortytsky, Kantserovsky, Vyrva, and most interestingly, Baida Island. It was there that archaeologists unearthed the remains of a 16th — century fortification as well as rifles, fragments of sabers, axes, arrow and spear heads, and coins dating to the time of Dmytro Vyshnevetsky. Another interesting fact is that so far no archaeological discoveries have been made on Khortytsia Island proper (Velyka Khortytsia) that would confirm the existence of Cossack fortifications. However, the memoirs of S. Myshetsky, H. Spassky, and others indicate that in 1618-1620 the Zaporozhian Cossacks built the fortress Kish on Khortytsia Island. It is believed that Hetman Petro Konashevych-Sahaidachny and his troops spent some time on the island during his sea campaigns against Turkey. These are reflected in legends and certain place names, like the Sahaidachny Natural Bounday, Sahaidak’s Bed and Smoking Pipe on Middle Rock, Gates of the Sich, and Sahaidachny’s Rampart. In his Stories of the Glorious Lower Rapids Zaporozhian Host A. Kashchenko insists that the fortress built by Sahaidachny on Khortytsia Island existed until 1625, when, following Zhmailo’s rebellion against Polish repressions, the Zaporozhian Cossacks had to retreat to the depths of the impassable bushes of Great Meadow. However, even afterwards Zaporozhian outposts existed during different periods in Khortytsia, until the Sich was finally liquidated. Thus, there were two Khortytsia Siches in the history of Zaporizhia: the one on Small Khortytsia (Malokhortytska Sich, 1553-1557) and the other on Great Khortytsia Island (Velykokhortytska Sich, 1618-1625). Mention should also be made of the period of time that elapsed between the capture of the Small Khortytsia Sich and the emergence of fortifications on Tomakivka Island. Was it possible that the Cossacks had no Sich during this period? No, the Cossacks did not leave the Dnipro; they retreated to the north, to Monastyrsky Island (today this place is practically in the center of Dnipropetrovsk). The name of the island comes from a monastery founded here ca. 870 by Byzantine monks and destroyed by the Tatars in 1224. Monastyrsky Island was the site of many dramatic events. Princess Olha and Prince St. Volodymyr stopped here on their way to Constantinople, yet the most exciting page in the island’s history is the lengthy residence of Hetman Prince Baida Vyshnevetsky. 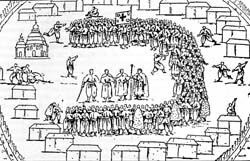 After the first Sich was destroyed in the spring of 1557, Vyshnevetsky went to Moscow where he was welcomed with pomp by Ivan the Terrible. The hetman prince joined the Muscovite tsar’s service and was rewarded with an appanage in Belevsky volost (smallest administrative division in tsarist Russia). Thus, before his campaign against the Crimea, Vyshnevetsky built a fortified camp on the island and left a garrison to guard it. The site for a fortified garrison was not chosen haphazardly. The island had long been used as an outpost on the merchant route “from the Varangians to the Greeks” and for the retinue of the Kyivan princes. In 1559 the fortified camp on Monastyrsky Island was replaced by a timber castle. Evidence of this is found in the contemporary Patriarchal and Voskresensky chronicles, whose entries indicate the existence of a castle, or ostroh, on the island. In 1550-1562, Monastyrsky Castle became a bulwark in the struggle against the Turkish-Tatar incursions. Vyshnevetsky spent most of his time fighting the Tatars on the Siversky Donets and Don rivers, in Circassia, and he stormed Azov several times. Each time he would return to Monastyrsky and the fortress that was a reliable base for rest and resupply. In 1552, Baida’s cousin Mykhailo Vyshnevetsky visited the island and brought him a writ of protection from the Polish king. (The rebellious prince had decided to return under the Polish crown.) Vyshnevetsky went to Poland and soon took part in a campaign against Moldova, which claimed his life. After Baida’s death the Cossacks left Monastyrsky Island and transferred the Sich to Tomakivka Island on the lower rapids. Thus, the fortifications built by Vyshnevetsky on Monastyrsky Island may be considered a Zaporozhian Sich and can be referred to as the Monastyrska Sich. The Zaporozhian Cossacks founded several Siches outside Ukraine, in addition to the Transdanubian Sich. A small Cherkasian town on the Don River, which later became the capital of the Don Cossack Host, was also founded by the Dnipro Cossacks. In his work Russian History since the Most Ancient Times Tatishchev writes that “during the rule of the Tsar and Grand Prince Ivan Vasilevich, the Cherkasians and Prince Vyshnevetsky came to the Don from beyond the Dnipro, settled there, and built a Cherkasian city.” Ukrainian Cossacks were called Cherkasians in Muscovy, the name derived from the city of Cherkasy. This “special little city” on the Don was in fact another Zaporozhian Sich, because it was an exact replica of the others on the Dnipro. As usual, they chose an island protected by water on all sides. The fortress was surrounded by an earthen rampart topped with a double oak palisade. The fortress was complete with towers built of timber and a water-filled moat. Like all the other Siches, the town consisted of kurins (buildings) and mud huts. Administratively it was also divided into kurins that later became known as stanytsias. Thus, one may conclude that there was a Zaporozhian Sich on the Don River (the Cherkasian Sich). Besides Russians, Ukrainian resettlers continued to expand the population of the Don region. This explains the inviolable military alliance between the Don and Zaporozhian Cossacks. Here is another little-known fact. The new (Pidpylnenska Sich) was not the last on the territory of Ukraine. After the destruction of the Sich, the Zaporozhian Cossacks who had refused to go beyond the Danube scattered all over southern Ukraine. However, the Zaporozhian leadership (Anton Holovaty, Sydir Bily, Zakhar Chepiha) did not abandon the idea of reviving the Sich and took advantage of Grigorii Potemkin’s intercession. In 1783, in a special “proclamation,” Potemkin expressed his intention to assemble the Zaporozhian Cossacks again. “I hereby announce that Regimental Commander and Captain of the Army Anton Holovaty has been instructed on my behalf to recruit Cossacks from among the residents of Azov gubernia, in the Slaviansk and Yelizavetinsk provinces, who once served in the Zaporozhian Host and who are willing to serve as such under my command.” Eight years after the abolition of the Sich, Zaporozhian Cossackdom was restored through the efforts of its leadership. True, they did not have a definite center like the Sich, but that was only for the time being. In 1787, on the eve of the war with Turkey, the Russian government granted the Zaporozhian Cossacks’ request and allowed them to establish a Military Kish at the natural boundary of Vasylkove, near the Buh Estuary. The Cossacks quickly established the usual Sich order, set up kurins, and held a council that elected Koshovy Otaman Sydir Bily. However, the Vasylkivska Sich did not exist for long. At the time the Cossacks were known as the Host of Loyal Zaporozhian Cossacks. Toward the end of 1788, in recognition of their active role in the Russo-Turkish war and special combat merits during the capture of fortresses on the Black Sea, the Cossack Host was renamed the Host of Black Sea Cossacks. After the war ended and in conjunction with the expansion of Russia’s borders in late 1789, the new Koshovy Otaman, Zakhar Chepiha, transferred the Kish to Slobodzeia, a village on the Dnister River, 20 versts (19 miles) from Bendery. Three palankas, small Cossack headquarters, were founded: Dnister (Podnistrovska), Berezanska, and Kinburn Spit (Kinburnska). The Slobodzeiska Sich was also short-lived. The tsarist government, which initially promised to give the Cossacks territories between the Buh and Dnister rivers, went back on its word again and in 1793 resettled the Black Sea Cossacks in the Kuban region. There was no Sich or Kish in the Kuban, and soon the Zaporozhian ways became a distant memory. The abolition of the Zaporozhian Sich by the tsarist government in 1775 and the distribution of Cossack lands among landowners forced some Cossacks to flee beyond the Danube into Turkish territory. With the Turkish government’s permission, the Zaporozhians founded another Zaporozhian Sich that became known as the Transdanubian Sich. But there was more than one. At first the Zaporozhian Sich occupied a small territory on the right bank of the Danube. The sultan allowed the Cossacks to build their Sich on St. George’s Island surrounded by the Sulina and St. George’s estuaries. In addition, the Zaporozhian Cossacks were allowed to settle on rivers and estuaries from the Danube to the Buh. Cossack palankas were set up near the Khadzhi-Bei and Tiligul estuaries, also at Peresyp (today’s Odesa). However, the Zaporozhians were not able to settle and build a Sich on the Danube because they clashed with the Lipovans or Nekrasovites, descendants of Old Believers who had fled the Don River region, fleeing persecution during the reign of Tsar Peter I. The conflict between the Zaporozhian Cossacks and the Lipovans became irreconcilable and often led to bloody and brutal skirmishes. In 1778, the sultan, wishing to prevent further bloodshed, ordered the Zaporozhians to cross with their kish further up the Danube, to Seimeny, located between the cities of Silistra and Rushchuk (today: Bulgaria). In late 1785, a large part of the Zaporozhians from beyond the Danube left the Seimenska Sich and settled on the Tisza in what was then the Austrian province of Banat, between the cities of Senta and Pancevo (currently in Serbia and Montenegro, respectively). According to an agreement with the Austrian government, the Zaporozhian Host retained its order and traditions, in return for serving on the Austrian border, for which the Cossacks were paid by the emperor on par with the Austrian army. The Cossacks lived on the Tisza for almost 20 years and left Austrian territory in 1804-1805 (the Banatska Sich is reflected in Cossack surnames like Banatsky, Zbanatsky). serving in return for clothes. The return of their comrades in arms from the Tisza breathed new life into the Seimenska Sich and gave the Cossacks a fresh impetus. They had long been cherishing plans to return to the Danube delta. The Cossacks wanted to be closer to Ukraine, and in 1811 the new Koshovy Otaman, Samuil Kalnybolotsky, and part of the host left Seimeny for Kilia Estuary, expelling the Lipovans from both banks. At Vilkove the Transdanubian Cossacks were joined by Zaporozhians who had settled there in 1775, and the joint force traveled to the Dunajec River, one of the Danube’s tributaries in the vicinity of Tulcea. But they were engaged by the Nekrasovites and had to retreat. The war between the Zaporozhians and the Nekrasovites lasted for two years, with both sides suffering heavy losses, but in 1814 the Zaporozhians stormed and seized Dunajec. The Lipovans had to beat a hasty retreat to Babadag from where the Turkish government shortly deported them to the town of Mainos in Asia Minor. The Dunavetska Sich was practically the same as all its predecessors on the Dnipro. Like before, there were no women. As in Zaporizhia, all married Cossacks lived in villages. Many of these are still in Dobrudzh (e.g., Slava Cherkaska, Slava Ruska, Zhurylivka, Baklazhanka, Honcharka). In May 1828, at the start of the Russo-Turkish War of 1828-29, the Transdanubian Zaporozhians led by Koshovy Otaman Osyp Hladky sided with the Russian army at Izmail and fought the Turks. In retaliation, the sultan ordered the Transdanubian Sich destroyed. This was the end of the last Zaporozhian Sich. As the above facts indicate, there were more than eight Zaporozhian Siches. Why did that number become fixed in Ukrainian history? Apparently the magic number seven played an important role here. Initially, there were only seven Zaporozhian Siches. For a long time Prince Dmytro Vyshnevetsky’s activities and personality were regarded negatively. After this historical figure was reassessed and his contributions to the formation of the Cossacks recognized, the town he founded on Mala Khortytsia Island was accepted as a Sich (eighth in number and the first according to the date of its founding). Another no less important reason is the lack of complete and reliable sources. Many historical materials have either vanished in historical cataclysms or were simply destroyed. Finally, despite the huge body of Cossack historiography, there is still no clear-cut and unequivocal conception of its origin and formation. If we agree that Vyshnevetsky’s small town in Mala Khortytsia was a Sich, then why shouldn’t we regard the town on Monastyrsky Island as a Sich? If the Cossack settlement in the area of the Oleshky natural boundary is considered a Sich, what about the Kish in the area of the Vasylkove natural boundary (at the mouth of the Southern Buh)? Another little-explored topic is the participation of Ukrainian Cossacks in the formation of other Cossack communities. The Zaporozhian Cossacks took an active part in the ethnogenesis of not only the Kuban Cossacks but also the Don, Terek, and Urals Cossacks in Russia — and possibly the Dnister-Danube haiduks. If we call the Siches on the Danube (and not just on the Dnipro) Zaporozhian, then why do we not do the same in regard to the Kishes on the Don, Dnister, or Tisza? These pages of Ukrainian Cossack history are awaiting serious and unbiased studies.